Angel of Waterloo: Jane Bennet, War Nurse: A Pride and Prejudice Variation Novel by Emma Osborne, free on Kindle. When Charles Bingley takes up his brother’s regimental appointment and goes across the channel to face Napoleon, Jane Bennet is faced with a choice… stay in Hertfordshire while her sisters court the Meryton regiment, or follow her heart to Brussels. When Jane’s letters stop coming, Elizabeth Bennet is determined to find her sister, no matter the cost. Mr. Darcy, concerned about his friend Charles Bingley’s sudden silence is also planning a trip across the channel and the two are thrust together in an uneasy alliance to discover the truth behind Jane and Bingley’s ominous silence. Kitty’s Lucky Charm: A Pride and Prejudice Variation by Bianca St James, a Kindle freebie. Catherine Bennet is in possession of the worst kind of luck. With three of her four sisters happily married, she is stuck in a quiet house with a sister who does not care for balls and dancing with garrison officers, or what new ribbons are in the shops in town. Mrs. Bennet might be anxious to have her married off, but for Kitty Bennet, nothing seems to be going right. Kitty’s luck takes a turn for the worse when a journey to visit her sister Elizabeth to help welcome their first child puts Kitty in a perilous situation. Her disappointment is unmatched, however, as she discovers that her only hope is not a dashing officer in regimental red, but a young man with ink-stained cuffs and an earnest smile. Miss Darcy’s Companion by Joana Starnes, a Kindle freebie. Miss Georgiana Darcy is need of a companion, and she would much rather not have Mrs Younge. The recently bereaved Miss Elizabeth Bennet is in need of a position. When she accepts the one Mr Darcy offers, she finds herself in his near-constant company and gets to know him at his best. Not as he would present himself to strangers in some remote corner of Hertfordshire, but as his nearest and dearest know him. An excellent brother, landlord, master. A wonderful man, noble, kind – and impossibly handsome. So who falls in love first? What of Mr Wickham and his dastardly ploys? And how is a lady’s companion ever to have a future with one who could marry into the best houses in the land? Holidays with Jane: Thankful Hearts by Ceclia Gray, Jessica Gray, Nancy Kelley, and more, a Kindle Freebie. t’s time for crisp weather, colorful leaves, and a Thanksgiving feast. The authors of the Holidays with Jane series bring you Holidays with Jane: Thankful Hearts with six modern-day adaptations of Jane Austen’s novels. Join your favorite heroines around the fire with a cup of hot apple cider for heart-warming takes on these classic stories. Amelia Elkins Elkins by A.M. Blair, a Kindle freebie. In 1817, if childbirth didn’t kill a woman, there were good odds a “miasma” would. Now, thanks to modern medicine, a woman’s demise at the prime of her life is uncommon enough to deserve an investigation. That’s what two lawyers at the Harville Firm promise to do when Amelia Elkins Elkins, a member of a prominent family with more baggage than money, contacts them in the wake of her mother’s untimely death. In this retelling of Jane Austen’s PERSUASION, Amelia and her sisters turn to the American court system to seek justice for their mother’s death. It’s too bad their conceited, silly father is doing everything he can — inadvertently, of course — to hinder their success. Fitzwilliam Darcy, An Honourable Man is a Pride and Prejudice variation. Not a simple retelling, it is an intriguing new story that does not follow canon. It is rated for mature audiences. Jewels on the Water: A Pride and Prejudice Sequel by Rachel Elizabeth, a Kindle freebie. Does love truly conquer all? Or is sadness inescapable? Is it worth the effort required to be free of its dark downward pull? The Victorian Age has been kind indeed to Gardiner-Bingley Enterprises, third largest company in Great Britain. Gardiner’s Emporium warehouses in London and Scarborough, and most recently expanded to include Bristol and New York City, are well supplied by the partnership with Bingley Shipping and Bingley Woolen Mills now headed by patriarch Charles Bingley. His second son, Thomas, is blessed with everything the mortal heart can most desire—good looks, splendid property, noble kindred—and his own ship. He enjoys his well-ordered life until the day he looks into the eyes of his heart’s partner and recognizes her for who she is. But mystery surrounds her. Why is a gentlewoman, a peeress, booked aboard a freight steamer enroute to America—without a maid or companion? Why does she deflect all questions about herself or her future plans? Like his father before him, Thomas quickly comprehends that he has found his ‘angel’. But will she fly away before he can convince her to stay? Although there is no explicit content in this story, it does deal with the sensitive topic of successfully recovering from sexual, physical, and emotional violence to find that life can still include ‘jewels on the water’. Mr Darcy’s Christmas Angel by Katy Green, a Kindle freebie. In this story, Lady Catherine never visited Longbourn so Elizabeth and Mr Darcy were never reunited. Mr Darcy is dangerously ill the following Christmas and calling for Elizabeth. Colonel Fitzwilliam goes to fetch her and what happens next is the subject of this festive short story. Darcy and Elizabeth: Duet in the Halls of Pemberley: Two Pride and Prejudice Variations by Cassandra Knightley, a Kindle freebie. Two chances for Darcy and Elizabeth to find their happily ever after! Escape to the polite society of Pride & Prejudice in these sweet, clean variations bubbling with spirit, humor, and romance. In the aftermath of Elizabeth’s rejection of Mr Darcy, the worst possible outcome has befallen the Bennet family. Mr Bennet has died unexpectedly, leaving his widow and unmarried daughters at the mercy of Mr Collins. In this time of hardship and sorrow, Mr Darcy shows his true nature through his kindness, generosity, and friendship. But will Darcy and Elizabeth be able to put aside their hurt pride and stubborn natures to find the Happilly Ever After they both seek? A stolen kiss at the Netherfield Ball sparks a merry war between Darcy and Elizabeth. After unexpectedly inheriting both a title and the fine estate of Messina Grove, Lord Bennet and his family leave Longbourn forever to start a new life of nobility. And why should they not? Mr. Bingley and his party had quit Netherfield no more than a week earlier, leaving Jane quite publicly heartbroken, and Elizabeth secretly so. But two years later, Lord and Lady Bennet receive a request from Lady Catherine De Bourgh asking if her Nephews and a small party would be welcome to stay at Messina Grove for a short duration. Jane is very excited to have a second chance with the still unmarried Mr. Bingley. Elizabeth does not care what Darcy does because she does not care at all about him! In this week of mischief and games, true love will be reunited and discovered, but hearts will also be broken when jealousy and old hurts rise. In this silly, clean variation, Cassandra Knightley knits together two of her favorite tales: Pride & Prejudice and Much Ado About Nothing. Pour yourself a cup of tea, take a seat on a comfy sofa, and be prepared to laugh and cry and swoon as Darcy and Elizabeth muddle their way towards true love in these two adorable P&P variations. What found its way into your mailbox this week? Mr. Bennet’s Dutiful Daughter by Joana Starnes re-imagines Pride & Prejudice in a way that places the Bennet family not in imagined, future peril but in imminent financial peril when Mr. Bennet is suddenly struck down by illness and unmoving. Elizabeth is struck by the news, as her father is her dearest connection besides Jane. However, as the circumstances of his illness are made known to Mr. Darcy without her knowledge, Elizabeth must weigh not only her father’s illness and recovery but also her own ability to save her family from being thrown out by Mr. Collins should the worst happen. Knowing that she has little choice, given the absence of Mr. Bingley from Netherfield, Elizabeth dutifully accepts the offer and hopes that her father will recover. Elated as Darcy is, he has convinced himself wrongly about why she has accepted his hand — offered in the most unusual and less-than-flattering way. As Elizabeth contends with her father’s care and her mother’s nerves, she has little time to contemplate the future, until it is too late. Starnes’ story is unique in that Elizabeth is forced into a marriage out of duty — a role reversal of sorts — and although she is grateful for his protection, she sees Darcy as a virtual unknown once she begins to get glimpses of his private nature. He becomes not stern and proud, but mercurial — guarded one moment and open the next. As she begins to get to know his true nature, her sense of duty to her family fades away, but when trouble rises again, can she convince Darcy that her heart is true to only him and their life together? Mr. Bennet’s Dutiful Daughter by Joana Starnes is a roller coaster ride of emotion, and when Darcy and Elizabeth try your patience, you’ll still be cheering them on. You want their happily ever after more than ever with all the obstacles and trauma they have endured. Frankenstein Darcy by Cass Grix, a giveaway win at JustJane1813. Pride and Prejudice meets Frankenstein. When he first comes to Hertfordshire, Frankenstein Darcy is a man of secrets, wanting to find peace. Falling in love with a provincial nobody is not in his plans. Elizabeth Bennet is both intrigued by this tall, dark, handsome stranger and infuriated by his arrogance. Neither of them realize how dangerous falling in love can be. 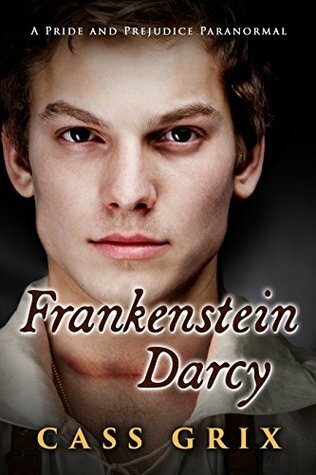 Frankenstein Darcy is a fun, romantic literary mashup, following the basic plot of Pride and Prejudice, one of the world’s greatest romances, and combining it with the themes of Frankenstein, one of the world’s greatest Gothic stories. In this full length novel, Darcy and Elizabeth deal with the conflict between science and religion, nature vs.nurture, love and friendship, and inner and outer beauty. 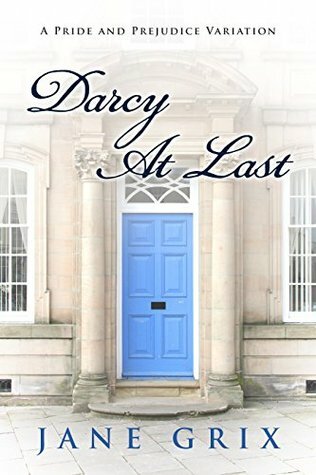 Darcy at Last by Jane Grix, a bonus from the giveaway win. 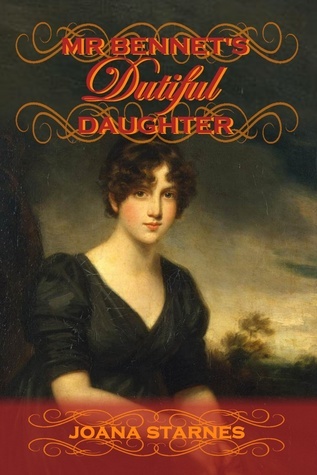 Mr. Bennet’s Dutiful Daughter by Joana Starnes, which I won from the blog tour. When Colonel Fitzwilliam’s disclosures are interrupted by the bearer of distressing news from Longbourn, Miss Elizabeth Bennet is compelled to accept an offer she would have otherwise dismissed out of hand. An offer of marriage from the all-too-proud Mr Darcy. Yet how is she to live with a husband she hardly knows and does not love? Will she continue to feel trapped in a marriage of convenience while events conspire to divide them? Or would love grow as, day by day and hour after hour, she learns to understand the man she married, before she loses his trust and his heart? Given the ‘early marriage’ premise, the issue of growing affection and intimacy is central to the story. The scenes are not graphic, but the novel does address mature themes. Make and Move: Shark by Jen Green for review. Get an up-close look at a shark’s body systems in Make and Move: Shark. This illustrated learning guide presents basic facts about shark anatomy in an easily accessible format, with colorful illustrations, simple explanations, and a large 20-piece floor puzzle with hinged joints. As readers learn about various types of sharks and how their bodies enable them to survive in the depths of the ocean, the puzzle is assembled layer by layer, providing a complete overview of how sharks have come to rule the world beneath the waves. Animal Adventures: Sharks by Cynthia Stierle for review. Animal Adventures: Sharks will take you beneath the ocean’s surface to meet the many sharks that lurk in the depths. 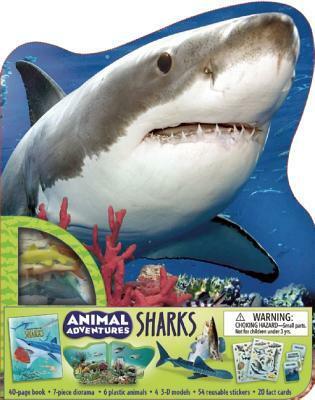 Have fun while learning, encounter sharks—large and small, gentle and fierce—with colorful illustrations and fascinating facts, and then build a diorama. Everything you need to explore the ocean is right here. 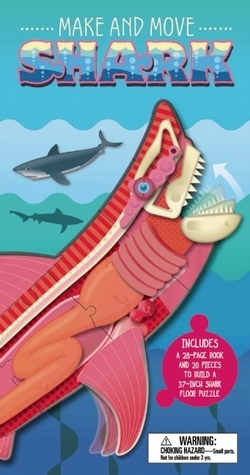 *This unique set includes a book full of colorful illustrations and intriguing facts about sharks, plus 3-D animal models and a diorama with reusable stickers. *Journey to all the world’s oceans to learn everything you need to know about these mysterious creatures. Animal Adventures: Sharks offers a unique learning experience as you meet wild and exotic animals face-to-face.